In the United States, MariTEL is setting a standard for wireless telecom services. For the first time, all marine vessels -- commercial and recreational -- will enjoy complete US coastal coverage. 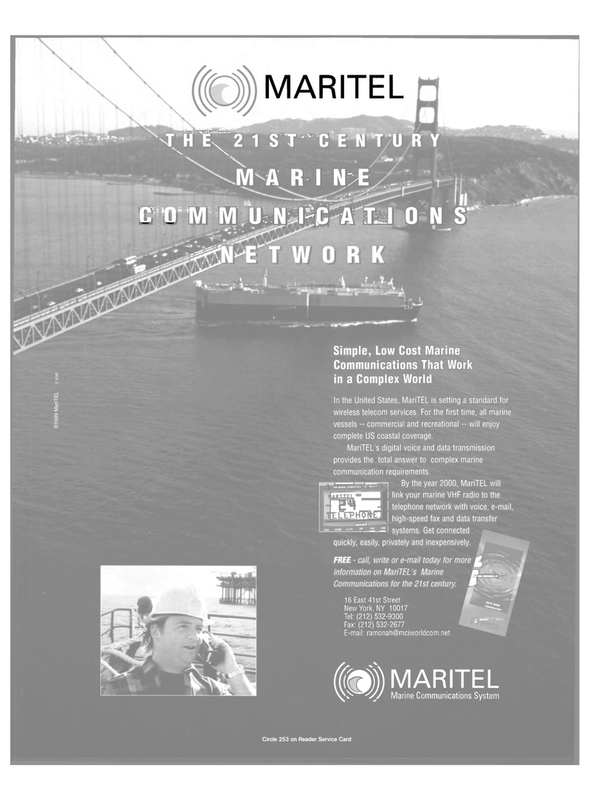 MariTEL's digital voice and data transmission provides the total answer to complex marine communication requirements. t,„ , By the year 2000, MariTEL will VHF MARINE TRANSCEIVER K .-M1«?7 J J ' mrangWMK link your marine VHF radio to the ||ajyJH|E telephone network with voice, e-mail, llIlKWul high-speed fax and data transfer mm "/|/|: '" — —I systems. Get connected ^^^ quickly, easily, privately and inexpensively.